This easy-to-use new edition of “Robbins and Cotran Review of Pathology” helps you effectively master the most important principles and facts in pathology. More than 1,100 questions – many new to this edition – reinforce the fundamentals of gross and microscopic pathology as well as the latest findings in molecular biology and genetics. 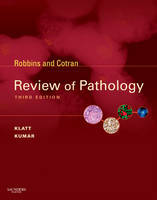 Based on two of the best-selling, most authoritative pathology textbooks – “Robbins and Cotran Pathologic Basis of Disease, 8th Edition” and “Basic Pathology, 8th Edition” – “Robbins and Cotran Review of Pathology, 3rd Edition” is an ideal aid for coursework, self-assessment, and examinations, including the USMLE Step 1 examination in pathology.